Can The JTX Freedom Air Rower Provide The High End Performance Expected Of It? The shape and structure of the JTX Freedom Air Rower is one of those modern, almost minimalist approaches to home gym equipment as the rail, seat, footrests and console seem fairly standard. However, there is one clear addition that makes this machines stand out over other models – the fan that provides that interesting combination of air and electro-magnetic resistance. 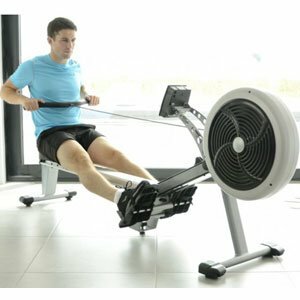 This foldable rowing machine is meant to be “ideal for strength and endurance training with its ergonomic design, 16 resistance levels and 8 workout programmes and also has a weight allowance of 130kg and a chest strap for monitoring heart rate. Does it do enough? 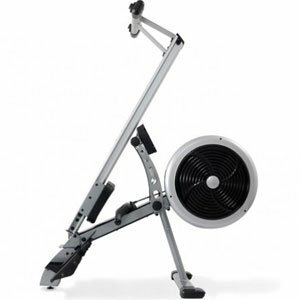 What benefits have buyers mentioned in their reviews for this JTX Foldable “Superior” Air Rower? 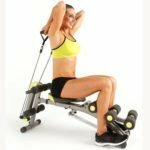 An aspect of this rowing machine that really stands out in the positive reviews is the quality of the build; not only is this machine sturdy and comfortable enough for buyers to use with confidence for long session, there are comparisons being made to the machines that buyers have used in the gym. This JTX Foldable Superior Rowing Machine has a reinforced aluminium beam, padded seat and posture support so there is the sense that users can keep going for a long time because it is so smooth. There also doesn’t seem to be any limitations in the software that might hold them back there either. 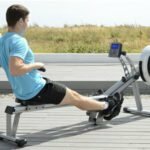 The software of this rowing machine is just as important as the hardware because it gives rowers the chance to build upon their workout and see their progress. The pre-set programming seems to be pretty good but one of the more interesting features here is the way that the programming can adjust the resistance based on performance, rather than sticking to strict increments, through the heart rate responsive system. Are there any downsides to choosing this JTX Freedom Air Rowing Machine for your home gym? The reviews for this machine are often full of high praise for the elements that surprised the reviewer, such as those smooth motions and that high-end feel. Sometimes they can be so focused on these pluses that the minuses are overlooked. It is interesting that in all the talk of the great components and programming there is no mention of the console. The promise is that it provides plenty of information on the workout via a back lit blue screen but there is little mention of the accuracy of this information or the ease of use. Similarly, this is sold as portable machine with transport wheels and an “easy-fold” frame but there is mention of that either. 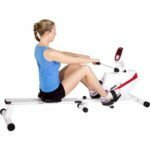 Summary: is this Foldable JTX Freedom Rowing Machine still a highly recommendable option? There is every chance that the features above were not mentioned in user reviews because buyers forgot, rather than because they were not worthy of inclusion, but it is important to remember that it is not all about the comfort and strength for a long workout or the adjustability of the software. 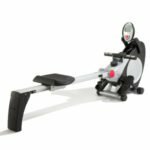 Whether this machine is foldable and easy to read or not, there are still plenty of benefits being seen by keen users across the design and performance of the JTX rowing machine and this means that it should be well suited to many home gyms. Find more reviews about the JTX Freedom Air Rower on JTX Fitness here.